From 1988-1999 Channel 4 ran a fabulous tv series called Whose Line Is It Anyway? which introduced the idea of improvised comedy to a new generation. I loved it and would marvel at how sharp the team were. The cast were able to respond quickly to a suggestion and create a funny song or sketch. 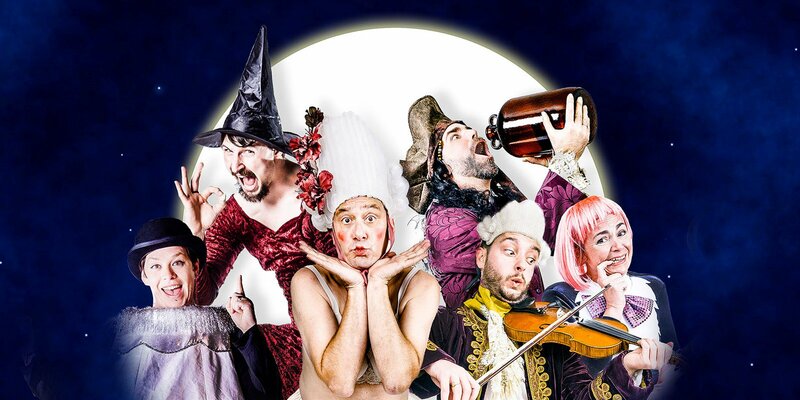 The Suggestibles are a North East based improvisation group who run courses and deliver shows throughout the year – seeing them in action is even better than that popular TV series. This is a show that starts with no script and no score. The music for the songs, the soundscapes and sound effects are created off the hoof. It is the 10th year of the show and many in the audience know what to expect and what to offer. From time to time action stops for a dance or a song with styles suggested by the audience. The interaction continues with accent or genre style suggestions. This results in the show changing from French to Film Noir to Shakespeare to Swedish in quick succession. The show is set on the Alice in Wonderland set for the current Northern Stage production and full use was made of its ramps, trollies & trapdoors to help deliver the entertainment. The set is in the round with the stage in the centre of the room and members of the audience on all 4 sides. Quick thinking can suddenly have the cast shooting off – for example the need for transport suddenly had two members of the cast running off for the hotel porter’s trollies that are used in Alice. The quality of the show is dependent on the suggestions but, speaking as a Pantso regular, they always seem to head in a similar, wonderfully rude, path. The show finishes with 12 days of Christmas, again using audience suggestions, which can make you blush or cringe. The cast of Bev Fox, Rachel Glover, Carl Kennedy, John Mawer, Ian McLaughlin, Alex Ross and Tom Walton deserve full praise for their creativity. Ian and Bev appear to be directing the action as it proceeds and try to keep the tale on track. The sharpness of the observations and ability to react in the centre of a three ringed circus makes this show an annual highlight for us and The Suggestibles remain one of the hottest comedy tickets in town.